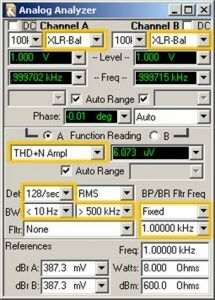 Applications Engineer Eric Schultheis examines how to test for glitches with a 2700 Series audio analyzer. ‘glich (noun) – derived from the German glitschig, or Yiddish glitsh, meaning ‘slippery’. (1) A short-lived fault in a system. (2) A false or spurious electronic signal caused by a brief, unwanted surge of electric power. Although not a standard audio measurement, glitch detection can be beneficial to anyone designing an audio device or trouble shooting an audio system. Examples might include checking a PC sound card to make sure audio response is flat as CPU usage varies, or measuring an amplifier where power up and/or down conditions may send an audible surge to connected loudspeakers. Note: Some glitches are to be expected when state is changing, however, the degree of what is acceptable can certainly be measured and given a limit. In this example we’ll set up a test to detect a glitch using a SYS-2722 audio analyzer. You can also perform this test with an ATS-2. Set the Analog Generator for a sine wave at 1 kHz. with the amplitude at 1 Vrms. Turn on the outputs and select the output configuration for your DUT (Device Under Test.) In our example we’ll use the balanced float (Bal-Float) configuration. 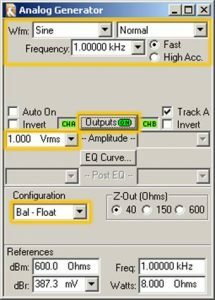 Set the Analog Analyzer inputs to match the outputs of your DUT. Select THD+N as the Function Reading. Set the Detector rate to 128/sec. Open up the bandwidth all the way (<10 Hz. to > 500 kHz.) Set the band reject filter to Fixed at 1 kHz. This will enable us to make 128 full bandwidth noise readings per second while notching out the 1 kHz stimulus signal from the generator. Set up the Sweep Panel so that Data 1 is analyzer THD+N amplitude (Anlr. THD+ N Ampl ) and Source 1 is external sweep time (Time. External Sweep Time). Set the Start to 0 sec., the Stop to 60 sec., and the Steps to 500. In the Settling Panel, change the Analog Analyzer THD+N Amplitude Settling Algorithm to None and its delay to 0.00 sec. This will post readings to the graph instantly (without waiting for settled readings). Finally, click the Sweep Start button in the tool bar or on the Sweep Panel. While the sweep is running (60 seconds duration) apply the condition to your DUT under which you expect the glitch to occur. In this example I toggled the Analog Generator off and on at the 30 second mark and the resulting glitch is visible on the graph. You may download this example test file “glitch_detection.at27” at the link below. AP2700 test file to accompany the knowledge base article on Glitch Detection.